It is easy to turn to the internet for some quick advice on the writing experience. It is just as easy to fall prey to bad advice if you don’t know what to look for. First, a little background. Once every year or so the twitter writing community will get flooded with some bad writing advice that everyone will give their hot take on. This week the writing community seems to be flooded with it more than normal. Everyone has an opinion, but how do you know which one is the right? It all started when a well-meaning author gave some controversial advice. In essence, he urged writers to quit their day job and commit themselves to the craft. Protip: The world is ending. Quit your day job. Throw your entire body, mind, heart, and soul into your dreams. If for some reason the world doesn’t end, you can always get another day job. But your dreams die with you. This isn’t the first time someone has thrown this idea out into the Twitter writing community. The whole concept romanticizes the idea of suffering for your art. In reality, it is a nice dream that very few can do. So, understandably, people called him out on this half-baked (dare I say privileged) advice. At the same time, an editor tweeted that manuscripts needed professional editing before being queried if writers wanted to be taken seriously (tweet deleted.) We know this might help some writers but definitely doesn’t apply to all. Again, the community called this advice out as being bad. 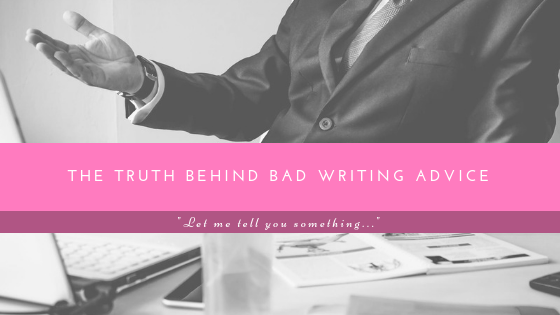 At one point author Victoria Schawb opened up about the worst advice she had seen as a published writer and started a thread in which everyone contributed the worst advice they had been given. Okay, Twitter, considering the Bad Takes this week, I want to hear the WORST writing advice you’ve ever been given. I highly recommend reading the thread collected there but… yeeeesh. It isn’t pretty. And here is some of the advice I received as a young high school student. What I don’t say in this tweet was the teacher insisted all romance stories be written with this basic formula in mind. She didn’t talk about meet-cutes and the standard Happily Ever After. She also disregarded my suggestion that switching the gender of the two characters would in her formula. It was… a very frustrating conversation. What makes the advice bad? Bad advice is advice given without experience and authority. There are no facts associated with the advice. Often it falls into the category of opinion. And finally, bad advice is given without the best intentions in mind. If you look at some of the bad writing advice people received from Victoria’s tweet there are a LOT of opinions. I also saw a lot that discouraged people from their passion or trying something new. And when it comes to experience… well, let’s talk about that in a second. Good advice isn’t always easy to swallow but if it has facts and comes from a person you trust with the information then maybe there is some merit to it. Here is the truth ya’ll, not all writing advice is GOOD writing advice. Wow, that’s kind of a weird thing for a blogger on writing advice to say, but it’s TRUE. Here is a little more truth when it comes to writing advice: Everyone has their own unique experiences when it comes to writing and publishing. What worked for one person might not be applicable to everyone. The internet is full of people who have opinions on everything and sometimes shouting those thoughts out into the void via twitter or WordPress helps solidify them. Having twitter and blogs makes us feel like what we say is important. Having experience in an unknown field makes us feel as if we have authority. Sometimes the world just wants to hear itself talk. But my advice and the advice of others is not a one-stop shop. For every post about querying and publishing, there will be another that contradicts those opinions. This is why researching the field is so important. I see people ask questions on facebook groups that are so easy to research and the advice they receive in return is sometimes questionable. Put in the work, search for trusty worthy resources and ask the questions to professionals and aspiring writers alike, but always take things with a grain of salt. After all, the world of publishing and writing changes. Trends, styles, and themes come in and out of style. Things that were well known and accepted tips 10/20 years ago may not apply to the always changing genres. Like the idea that all adverbs must be stricken from every page of your story. Stephen King was the one who said, “The road to hell is paved with adverbs.” Stephen King. This isn’t necessarily bad advice, and King definitely knows what he is talking about when it comes to writing, but sometimes people take this advice too far. The last “twitter bad advice storm” involved a writer who urged others to delete every single adverb from their manuscript. Which is silly, open the nearest book and you’ll probably turn to a page with an adverb. In Hindsight, let’s look back at the bad advice we’ve been given. Was my English Teacher wrong when she told me the basic formula of a romance novel? Not really, because the formula she presented had worked for tons of books, but it wasn’t the whole story. Her sources were … outdated. And she wasn’t a romance writer. She never even told me if she read the genre before. Which made her advice not fully formed. She was wrong was when she doubled down on this belief and didn’t concede that maybe her “formula” was off. If you ask 100 different romances writers they all might have a different idea on that the “formula” is. Reader, I’m saying you need to think about the advice you are receiving when it comes to writing. Is it good advice or bad advice and why does the information fall into those two categories? Do yourself a favor and take everything with a hint of skepticism. Ask the same question to other people and understand that when you throw yourself and your money into writing you may receive different results. Are You Ready to Join a Critique Group? What Will My Book Career Look Like? Great post! Personally, the advice to “quit your day job” to follow your passion has always done more harm for me than good. It makes me feel like a failure for being unable to do that–and I expect I’m not alone in that feeling. Thanks for the comment. I feel like quitting your job to write full time for some people, myself included, is a dream (just like getting published.) Understanding our responsibilities to ourselves and our families is nothing to be ashamed of. Writing while working a full-time job is definitely more challenging and makes you THAT much cooler for finishing your novel.